Use your dark magic to corrupt the minds of the living and summon fourth a legion of the dead! A Boss Deck replaces your personal deck in the Hero Realms Deckbuilding Game. With it, play against 1-5 players using Hero Realms Character Packs or against another Boss Deck. 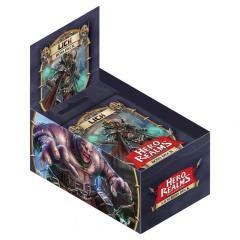 Hero Realms Boss Decks require the Hero Realms Deckbuilding Game and play best with Hero Realms Character Packs.